I am an open-minded taster. My motto is to try all types of wine. However, I am also mindful of wasting time, mine and other people's, so if I get a request for an appointment to taste wine that I know won't fit in at The Wine House, I'll decline the offer. A vendor who I like to do business with because he is a one-man operation who has the same enthusiasm for wine as I do, sent me a appointment request for a winery from Lebanon. I was intrigued, but it was a busy time, and for what ever reason, I forgot to respond. This vendor did not take "no", or more like a non-response, as an answer and called me on the phone to persuade me to taste the wine. I said "yes" as I had time in the day to do so. The common perception is that Château d'Yquem stands alone at the top of the pyramid when it comes to quality. 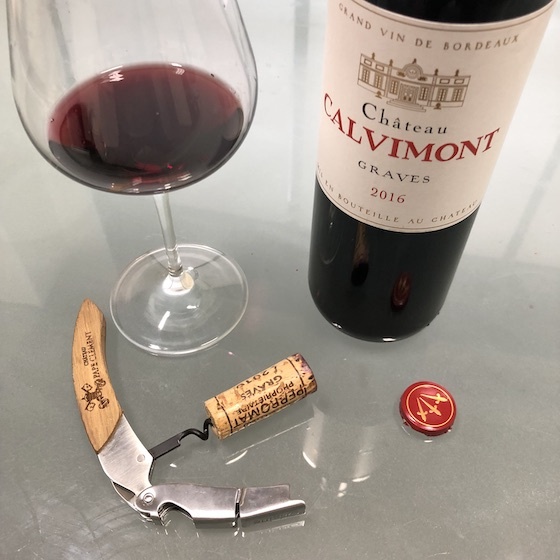 While this may be true in general, there is a wine, only made in the best vintages, which challenges that perception: Château Coutet's Cuvée Madame. As the story goes, the cuvée was named after Madame Rolland-Guy, who owned the estate until 1977. The vineyard workers would dedicate a day's work to her, without pay, while picking the most concentrated Sémillon grapes from the two oldest parcels of the Premier Cru vineyard. 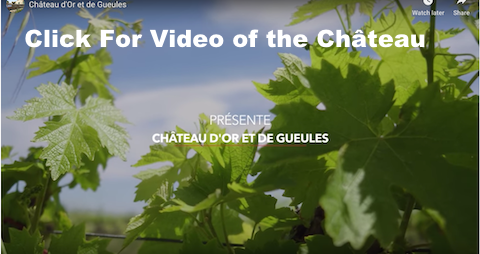 (More information can be found on the château's website by clicking here.) Production for the Cuvée Madame has typically been around 1200 bottles. It is not made in every vintage. In fact the 2009 Cuvée Madame represents only the 15th vintage of this wine first made in 1943. 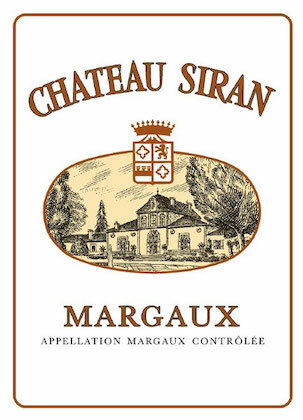 The wine is bottled and aged at the chateau for around a decade and then released. The next installment of Cuvée Madame will be the 2014 vintage, slated to be released in 2026! The growing season of 2009 was marked by warm and dry conditions, this extended through an Indian summer allowing the fruit to reach an exceptional maturation level. The rains came on 18 September which kickstarted the botrytis which spread over the very ripe berries. It took just 6 passes to complete the harvest, with 70% of the fruit picked on the third pass. Production was slightly more than usual with 1900 bottles produced, 1600 of which are planned for release . 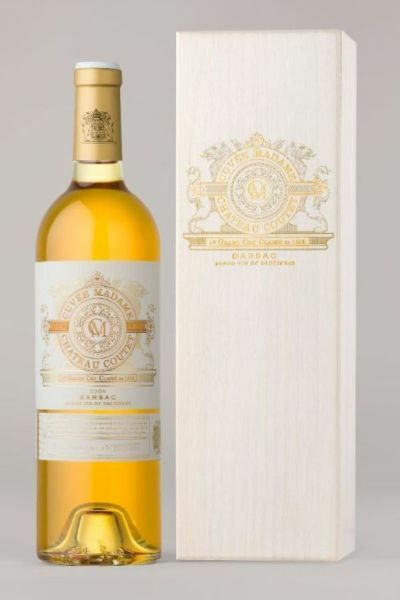 All in all, 2009 was a monumental vintage for Coutet, Barsac, and for the entirety of Sauternes! was established in 1961, and continues to be a family run estate with its third generation at the helm. We took the leap last year to begin importing their wines after an introduction by Tiziana Settimo of Barolo's Aurelio Settimo, whose wines we also import. 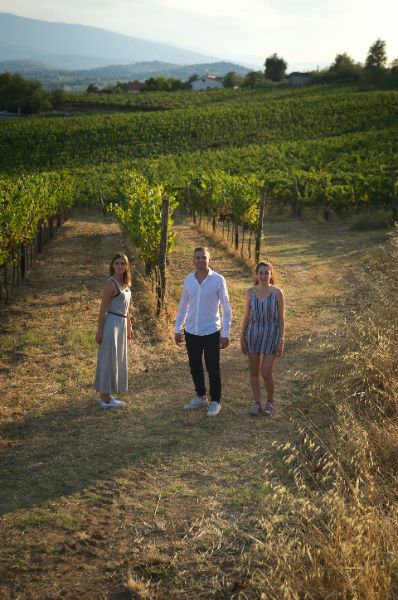 People often ask how we source our wines from abroad, and in this instance, it was a respected winemaker (Tiziana) that connected us to Torre Zambra. Our relationships with the producers we import are vital to the strength of our business. We are in this together. So when someone like Tiziana suggests checking out another winery, we listen. So many of you have delighted in Torre Zambra's vibrant rosato, Cerasuolo d'Abruzzo, their classic, zippy Pecorino and their many styles of Montepulciano. 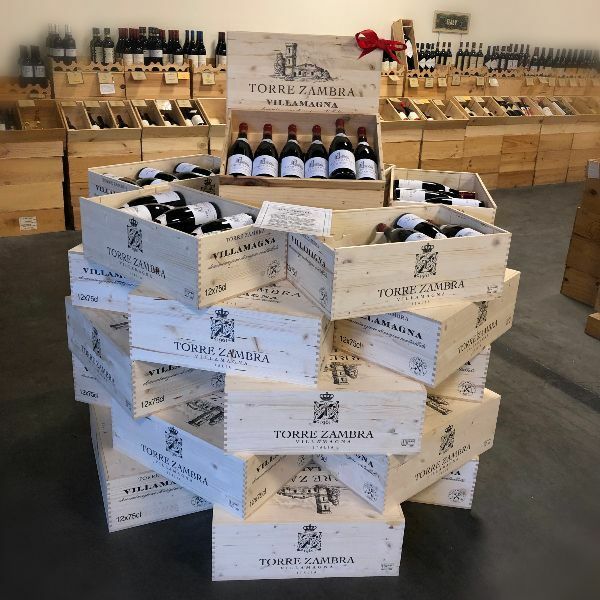 Well, we have one more wine from Torre Zambra that arrived last month during the frenzy of the holiday rush, the 2015 Villamagna DOC. A recent DOC, created in 2011, Villamagna is considered the finest terroir of the Abruzzo, limited to a total of 85 hectares among three municipal districts, Vacri, Bucchianico, and Villamagna. Torre Zambra's hillside estate vines are grown at 500-1000 feet in elevation with an ideal south-east facing aspect within the village of Villamagna. The 2015 Villamagna is lush and supple. It highlights the best of the Montepulciano grape, showcasing plenty of fruit, a dark robe and gentle tannins. Too often when making their "best" wines, producers in Abruzzo throw too much oak on Montepulciano, masking its inherent approachability. TZ's Villamagna is fermented in stainless steel tank, aged in large cement vats for a year and then rests in bottle for another 6 months. The resulting wine is pure, unadulterated fruit. There are flavors of red cherry and plum, notes of cocoa powder and an underpinning of leather. Its gorgeous, plush mouthfeel reminds me of some Châteauneuf-du-Pâpes. The 2015 Villamagna is constructed for maximum tasting pleasure. I drank the 2015 Villamagna on two occasions; once on Christmas day with ricotta-stuffed, baked shell pasta and on New Year's Eve with grilled steaks. In both instances the wine delivered on my expectations for a generous, high-impact fruit wine without any pretensions. Sometimes the mood strikes for more yummy, and less contemplative. The last couple weeks held many life lessons for me on facing down doing what is right even if it is hard or uncomfortable. These moments don't always present themselves in a way you can reflect on after the fact. But this time they did and left me feeling better than I felt before dealing with them. It's nice to be able to pat yourself on the back sometimes. And in this spirit, I think I'll buy another bottle of 2015 Villamagna to enjoy with dinner as another winter's storm passes overhead. Brrr!! That chill in the air can only mean one thing, it's winter, February to be specific. Though the shortest month, there are plenty of reasons to be festive in February. You've got Valentine's Day and Presidents' Day at the very least. The February Dirty Dozen consists of 12 bottles, all different, all chosen for their quality and versatility. Pack in a cheat-sheet with some background and pairing suggestions, and you're looking at the best wine deal in town! 2015 Juhfark, Tornai $14.98 net price, $13.48 reorder The Tornai family has been working vines in Hungary’s Somló region since 1946. Somló’s volcanic, basalt-rich soils are prized for growing wine grapes. Tornai’s Juhfark is the perfect introduction to this high-acid grape. The classic flavors of salt and smoke are present, without any botrytis, and finishes with a tart tang. Versatile, try it with salty, savory foods. 2017 Chenin Blanc, Kiona $13.98 net price, $12.58 reorder Washington State’s Kiona winery is the source for high quality, affordable wines. How do they do it? Their Chenin Blanc is a dead-ringer for Vouvray, expressing stone pit fruit and fresh acidity. The grapes are harvested early to retain freshness, then tank fermented. Ever so slightly off-dry, this wine is a dream for pairing possibilities! No limits here. 2017 Pinot Gris, Chemistry $14.98 net price, $13.48 reorder Chemistry is a first collaboration between Oregon’s Stoller Family Estates and Chehalem’s winemaking teams. This debut Pinot Gris promises good things to come. Sourcing throughout the Willamette Valley, blending diverse sites and keeping prices low, allows entrée to this special wine region. Lots of citrus with a kiss of papaya, striking a nice balance. 2017 Ventoux Rosé, Domaine Fondrèche $16.99, $13.59 reorder We are big fans of winemaker Sébastien Vincenti and his wines from arguably the best vineyards of Ventoux. For his Rosé, Vincenti uses 50% Cinsault, 25% Syrah, and 25% Grenache from vines averaging 25+ years of age. Red berry fruit and minerals appear in the aromas and the palate is snappy and fresh with a crisp finish. Spicy Thai prawns? Pop this. 2017 Ortrugo, Cantine Fratelli Bonelli $12.99, $10.39 reorder Ortrugo, anyone? 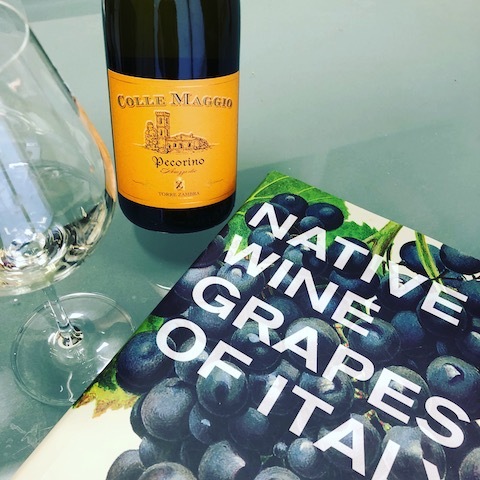 This white grape, indigenous to the Piacenza region (roughly 65 km southeast of Milano), is one of hundreds of local Italian varieties awaiting discovery by the international market. First off, it’s dry. It shows floral aromas with maybe a hint of white pepper. Its light body makes it incredibly versatile, so pair it with shellfish or poultry. 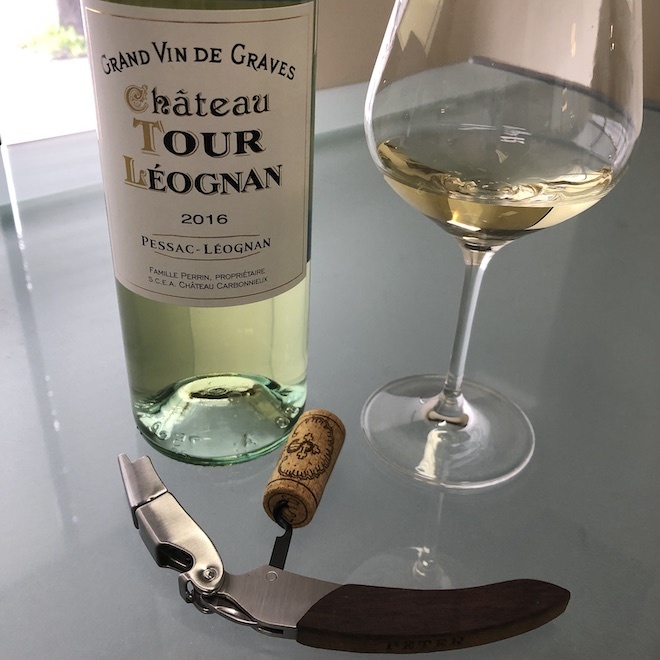 2017 Montravel Terrement, Château Puy-Servain $14.99, $11.99 reorder Way out near Bordeaux’s eastern frontier, across the Dordogne River lie the vineyards of Montravel. The area is mostly known for its white wines, though some red grapes grow there also. Château Puy-Servain’s white Terrement cuvée is one of our best bargains in the white wine world. A 50/50 blend of Sauvignon Blanc and Sauvignon Gris, pair it with a chèvre salad. 2015 Monica di Sardegna, Argiolas $13.98 net price, $12.58 reorder Always on the hunt to introduce Dirty Dozen devotees to unusual, lesser known varietals (see Juhfark above), welcome to Monica, a grape exclusively found on the island of Sardinia. Its soft tannins and ripe berry flavors make it a popular choice for everyday drinking enjoyment. Great with pasta dishes, fish stews, or pizza while bingeing on Friends. 2015 Pinot Noir, Praxis $22.98 net price, $20.68 reorder Bill Arbios, a winemaker for over forty years (! ), crafts this gorgeous Pinot Noir from a single vineyard at the southern end of the Sonoma Coast appellation, west of the town of Sonoma. Aged in French oak for nine months, of which 1/3 is new, this cherry-laden Pinot Noir is well balanced and elegant. Leg of lamb studded with garlic should match-up nicely! 2017 Fidelity Red, Goldschmidt Vineyards $15.98 net price, $14.38 reorder New Zealand born, globetrotting winemaker Nick Goldschmidt currently makes wine in four countries! 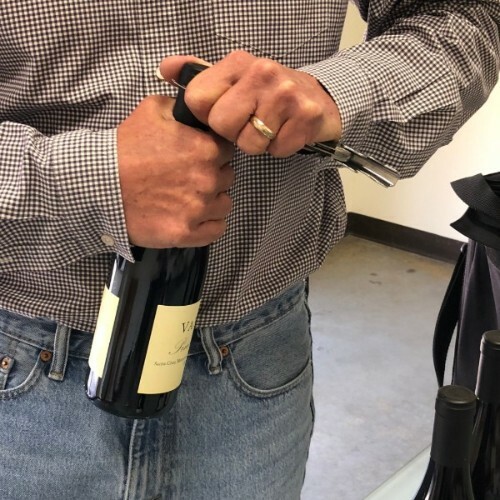 His home base is California and he makes this Bordeaux-styled red from a single vineyard in Alexander Valley that he has farmed for over 25 years. A blend of Merlot, Cabernet Sauvignon and Petit Verdot, it exhibits plum, cassis and notes of vanilla. Steak? 2015 Côtes-du-Rhône, Tour de l’Isle $15.99, $12.79 reorder Made from Grenache, Syrah, and a little Mourvèdre, this C-d-R tips the scales in the quality for price world. It shows aromas of ripe cherry fruit, cracked black pepper, and forest floor. The palate is harmonious with rounded tannins and a lively finish. Rhône-meister Robert Rochhi has blended us another winner that will pair well with a roast or hearty stew. 2015 Montepulciano d’Abruzzo Colle Maggio, Torre Zambra $18.99, $15.19 reorder The latest release from our (fairly) new d’Abruzzo producer, Torre Zambra, the 2015 Colle Maggio Montepulciano is teeming with character. Rustic raspberry, spice, cocoa, and coffee notes appear in the aromas, and the palate is medium-bodied and complex. It has a snappy, balanced finish with all components firing together. Pairs well with pizza or pasta. 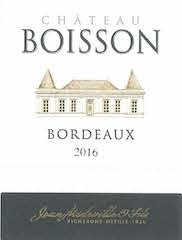 2015 Château de Rouquette, Bordeaux $10.98 net price, $9.88 reorder Another wine right off the boat, this bargain Bordeaux turns heads simply by virtue of its expressive fruity aromas and palate and its super-modest price tag. Made from 80% Merlot and 20% Cabernet Sauvignon, it’s nice and juicy where it needs to be, and has a sturdy backbone. It drinks well on its own, as a cocktail wine, but you can pair it with a steak too! is a small appellation along the Garonne River opposite from Barsac. In Sainte-Croix-du-Mont they grow Sémillon, Sauvignon Blanc and a tiny bit of Muscadelle, making dessert wine not entirely unlike Sauternes, but then again quite different. Sainte-Croix-du-Monts are lighter, less botrytised and unctous sweet wines. To compare them solely to Sauternes is a mistake and can lead one to overlook a very good opportunity to enjoy another style of sweet wine. The Chateau Les Arroucats Cuveé Virginie is a favorite one here at The Wine House. And as anyone who walks through our doors discovers - we love sweet wines! Context is everything when it comes to appreciating non-dry whites and keeping an open mouth and palate will derive oodles of tasting pleasure. Over the last two weeks, I've opened several bottles of the Arroucats to serve with, and instead of, dessert. Because it is lighter in body and less heady, it's perfect to open up on a whim and not fuss whether or not your guests are giving it the proper attention. I can attest that is goes well with Sicilian Cannolis, panettone and quality cheeses. Last night I poured a glass with a couple of shards of peanut brittle. A great combination. The nutty, buttery candy was uplifted by the sweet cream and citrus notes of the Arroucats. Chateau Les Arroucats was established by Christian Labat after WWII. 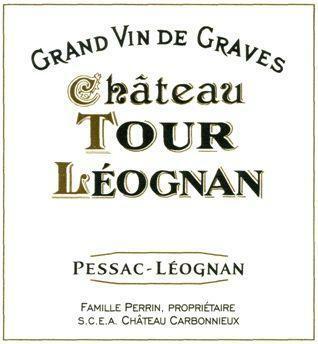 The estate was taken over by his daughter, Annie Lapouge, who was credited for modernizing the winery. Today the winery is managed by Mme. Lapouge's daughter, Virginie. They hand-harvest the grapes over several passages then ferment them in concrete and stainless steel vats. The wine ages for one to two years in vats before bottling. The wine is not aged in any wood, hence the fresh, fruity flavors. 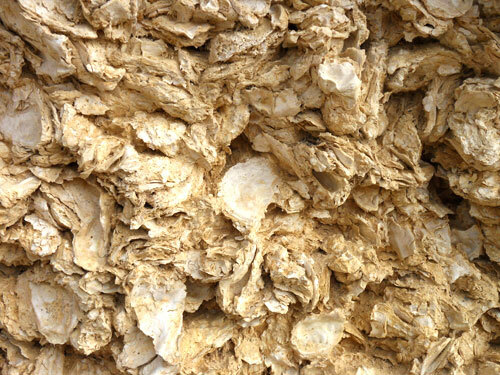 The grapes at the estate average over forty years and grow on clay-calcareous soils that sit above on a plateau of an ancient seabed as evidenced by the thick layer of oyster shells (see picture above). 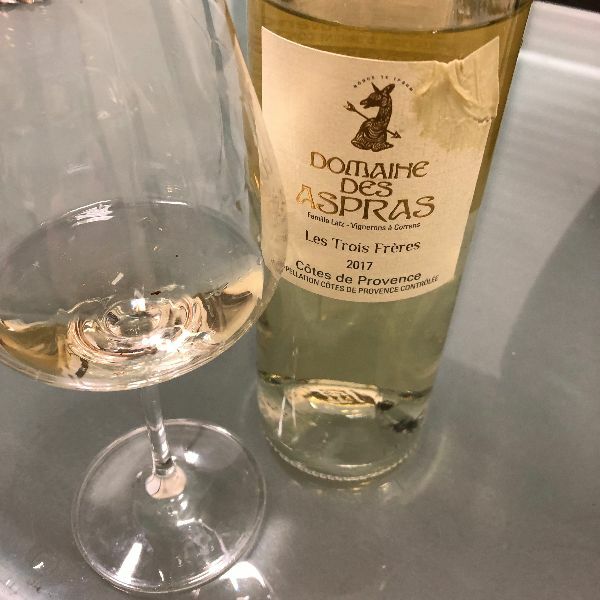 It is no secret that demand for these lighter-styled dessert wines has waned, so it's no small miracle that such a terrific one like Les Arroucats is still being produced AND at such an affordable price! At $14.99 it is a steal and it gets better...it discounts 15% by the case! Happy New Year! Here we are again, it’s January, and the slate has been wiped clean. 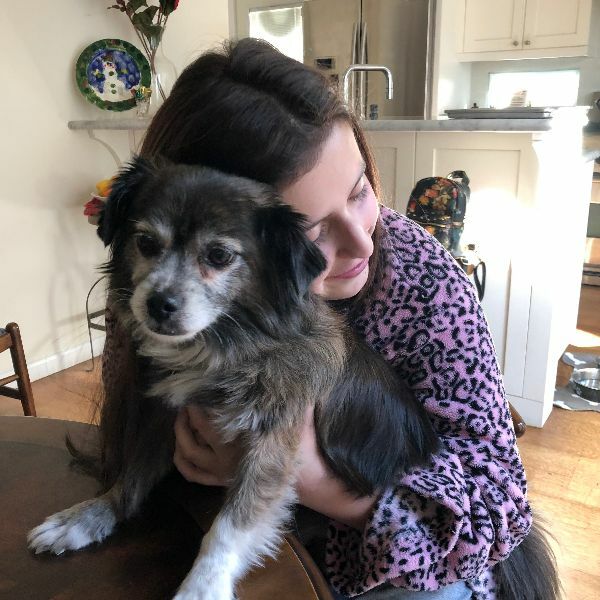 2019 has arrived, and here in northern California, the chill is setting in (by our standards). We looked at today’s forecast, and it says that the next week will be a wet one. So, while we stay dry indoors, we’re thinking it’s time to make a hearty dish to pair with a wine from our January Dirty Dozen! Traveling east from Rias Baixas in Spain, next up is Ribeiro. Here the influence of the Atlantic is still felt, but the rainfall is slightly lower and the temperatures slightly warmer. This blend of mostly Treixadura combines sunny, citrusy fruit with a solid backbone of acidity. Golden green color in the glass, pair with deep fried veggies or crustaceans. This Central Coast Chardonnay has been our bestselling white from California under $25 for several vintages. Rich and creamy with just the right amount of oak, it appeals to a wide range of palates that appreciate rich fruit, oaky notes and balance. The label attracts the eye, the wine keeps customers buying it over and over. Nosh with lemon roasted chicken. Vienna is the only world capital with a significant wine production. It has its own appellation and hundreds of years of wine history. Gemischter Satz is a single wine from a multiple varietal vineyard. Paul Bernreiter makes Gemischter Satz for his heuriger (wine bar/restaurant), but some makes it here. Lively, try with fried meat, cabbage or mushroom tarts. 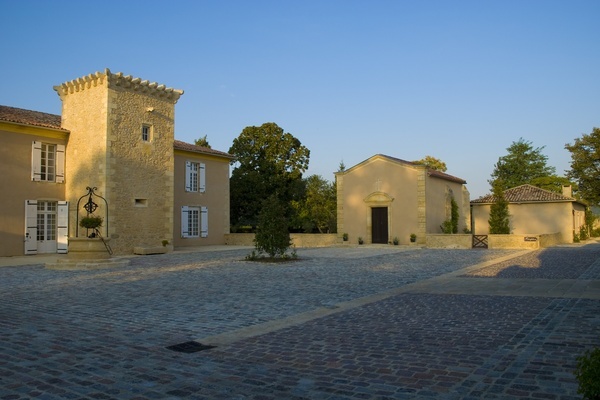 This estate owns nearly 30 acres of vines grown along the Garonne River. The vineyard sits atop a hill that overlooks ancient stone quarries. A 50/50 blend of Sauvignon Blanc and Sauvignon Gris, this tank-fermented white offers plenty of orange blossom and perky citrus notes. Ideal with ingredients like goat cheese, smoked salmon or trout and raw oysters. Limited contact between the grape skins and fermented juice creates the vibrant magenta color of Cerasuolo d’Abruzzo. Torre Zambra’s is made exclusively from the varietal, Montepulciano. Cherry on the nose, cherry on the palate and cherry on the finish is the name of the game. Delicious with seafood stews, spicy sausage pizzas and cheesesteaks. Lugana is a viticultural appellation that straddles the regional border of Lombardy in the west with Veneto in the east. Ca’Lojera’s vineyards are located near Brescia along the flatlands of Lake Garda. It is here that the grape Turbiana flourishes, producing wines of complexity and minerality. Lush and structured, pair up with pan-roasted halibut. This is the 3rd vintage we’ve stocked from winemaker Andrew Jones. His Wonderwall Pinot Noir offers great value, using fruit from well-placed vineyards along the Pacific Coast. Telltale flavors of red cherry, black tea and cola permeate the palate. Jammy, yet light on its feet, food pairing possibilities are endless. Coq Au Vin or Chicken Marbella would be nice! This simple, delicious Tempranillo is yet another example of why Spain is where one should look first for well-made, affordable reds. Nothing fancy, the grapes are fermented in steel and aged in concrete vats. The flavors are redolent of black berry and tangy raspberry with gentle tannins and a plush mouthfeel. Serve with tagines, tahdiq or paella. 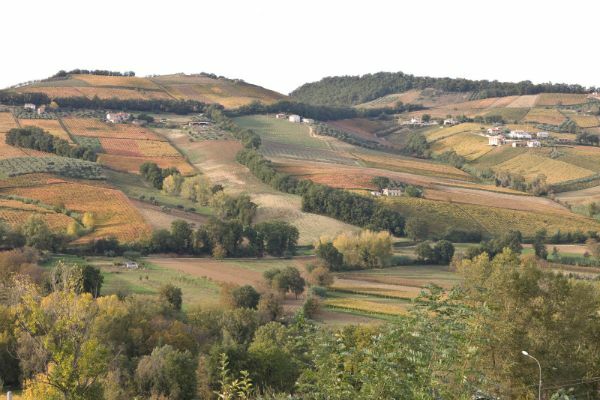 The Scavino family have been making world-famous Barolo since 1921. What a thrill to discover their Vino Rosso, a blend of Nebbiolo, Dolcetto, Barbera and Merlot. A delightful table wine that affords everyday enjoyment from a super star producer. Light to medium-bodied, tangy red fruit with lots of freshness. Pair with red-sauced pasta and/or meatballs. 70% Merlot, 25% Cabernet Sauvignon, 5% Cabernet Franc, aged and fermented in steel tank. Bright red berry and black currant aromas, palate is more focused and less whimsical, the fruit is part of the overall balanced structure. The finish is substantial with sticky tannins that linger. Fans of The Beatles know what to hum when sipping this wine. 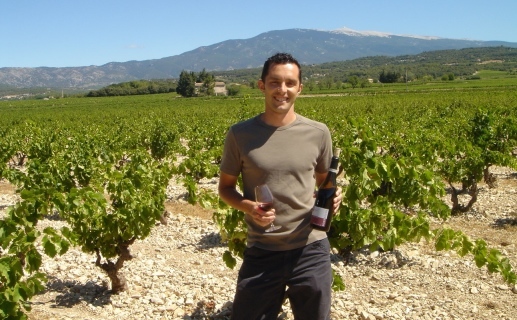 A recent featured article in Wine Spectator described Fondreche’s Sebastien Vincenti as “an obsessively fastidious grower and winemaker”. His entry-level Ventoux (Grenache, Syrah and Mourvedre) captures the essence of the region, making a red that combines mature fruit with a thread of freshness and minerality. Pair with Mediterranean cuisine. 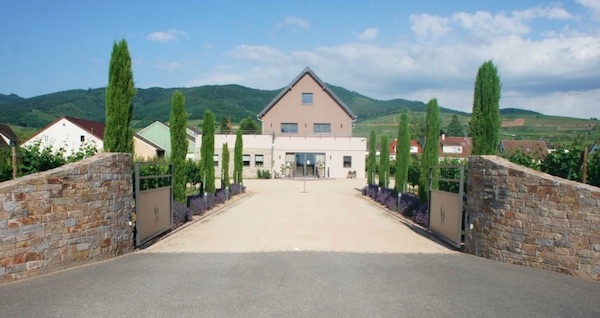 Domaine des Aspras was established by the Lutz family in the early 1960’s. Mostly Merlot, the À Lisa is a funky, quirky Provençal red that highlights the impeccable organic farming of this estate. Unoaked with plenty of red berry fruit that couples harmoniously with the tame and mild tannins. Serve with Beef Daube, Stroganoff, Goulash or Bourguignon. Let's Say Goodbye To 2018! And certainly there were high points and low points throughout 2018 for all of us, but it's not out of the norm to be reflective about them as we look forward to the coming New Year. Doubtless, we all enjoyed some special bottles during the year, with several of them being enjoyed within the past month or so. This is neither the time nor the forum for name-dropping, or label-dropping as it might be called. What is most important is that we share our wine and our time, with friends, colleagues, and loved ones. As long as the wine is being shared, what's on the label isn't as important. My favorite wine writer, Andrew Jefford, penned an article in Decanter Magazine yesterday titled, "Are you a wine label drinker?" Not to parrot too much from said article, though I was moved by this analogy, "You don’t have to be standing in the Grand Canyon to experience the wonder of nature." In this case meaning that one doesn't require tasting the finest of the finest to enjoy their wine tasting experience. The article makes several other points that struck chords with me, but that was the biggie. Case in point, last Tuesday I enjoyed a mellow Christmas lunch with my brother and our Mother, who is in her 90's. Mom insists on paying for the wine that I bring her, and also believes that anything over $10 is overpriced. I think you get the idea as to what kind of wine we shared. What are you going to do? To stew over not drinking something fancy would ruin the occasion. I happily poured her a glass of French Merlot in her price range, and get this, when I finished she looked at me and said, "You can pour some more, you know." It was a light-hearted moment enjoyed by the three of us. After lunch, I headed back in to the city to the home of some good friends and a group of around 15. We all were treated to some amazing dishes with Dungeness Crab and Prime Rib being the two headliners. Some of my fellow party goers brought some very nice bottles, and I brought some also, though the ones that I brought weren't quite up to the stature of a mature Bordeaux in magnum! It mattered not. The Trebbiano d'Abruzzo was great with the crab, though I fear our tapping into it during cocktail hour perpetuated its exhaustion midway through the crab dish. The rustic Cabernet Sauvignon from Lake Garda in Italy was terrific with the Prime Rib, and was the topic of some interesting conversation. The dinner was a smashing success for all involved and the sentiments around the table were positive and loving. Looking back, after returning home, it was the best Christmas I've spent in years. By the way, to my friend, P.S., thank you very much for bringing that magnum. It was stunningly good! It's true that some pretty fancy, special wines are gifted and consumed during the holidays. I have helped many customers find some special bottles for gifts and for themselves. I probably don't need to mention that I am one of those customers! I've been lucky enough to receive some special wines as gifts as well, and for that, I am very grateful. As a friend of mine regularly says, "There are traditions, but there are no rules." For me, when it comes to special wines, fancy or not, there is one rule: It must be shared. This is a must. As independent as I tend to be, I do not waver from this rule. I have a handful of wine loving friends with which I share the fancy stuff, but you won't ever see me reach into one of my boxes here and take home a Leoville Las Cases to enjoy with some takeout on a Tuesday. Of course, these friends also have been very generous with me. There are a couple of occasions on the horizon for which I have an inkling to bring something special, but when the madness of December at TWH simmers at the end of a weekday, I just want to get home and relax, cook up some dinner and have a glass of wine or two. A wine that really does the trick for me is the 2016 Domaine St. Rémy Rosenberg Pinot Noir. It's a special wine in its own right. It's complex, delicious, doesn't cost a lot, and it's pretty versatile. Coming in just under $20 (mixed case price), I don't feel like I need to share the experience each time I have a glass of it, but hey, I'm in the industry and like to drink complex, delicious wines ... even if I'm going home alone on a Wednesday night. The aromatics are proper - red berries, strawberries even, crushed autumn leaves, forest floor, and a hint of the sauvage. The palate is lightweight and lively, the fruit expressive and the complexity abundant. And though the fruit is a ripe, signature Pinot Noir fruit, there is something unmistakably Old World about this wine. It's dry, there is no perceptible sweetness to it at all. Its versatility is where it really hits home. Though it wouldn't be my first choice with a rib-eye, it is my first choice with a Neapolitan Pizza. In fact, it will work with almost all red sauce based Mediterranean cuisine. It goes great with burgers and pork chops, heck one can even enjoy it with salmon!Founded in 1725, Domaine St. Rémy is in the Alsatian town of Wettolsheim, just southwest of the region's picturesque showpiece, Colmar. Corinne and Philippe Ehrhart have several holdings in the vicinity, including Grand Crus Brand, Hengst, Schlossberg, and Goldert. Certified organic in 2010, they are now farming biodynamically, and have been certified since 2012. They produce Pinot Noir, Pinot Gris, Pinot Auxerrois, Riesling, Gewurztraminer, Muscat, and they make a sparkling Crémant using Chardonnay. We've been working with the Ehrharts for over 15 years and are happy to be their California importer. If it isn't Champagne, what do you call it? In France, the term used to denote a sparkling wine other than Champagne is Crémant. 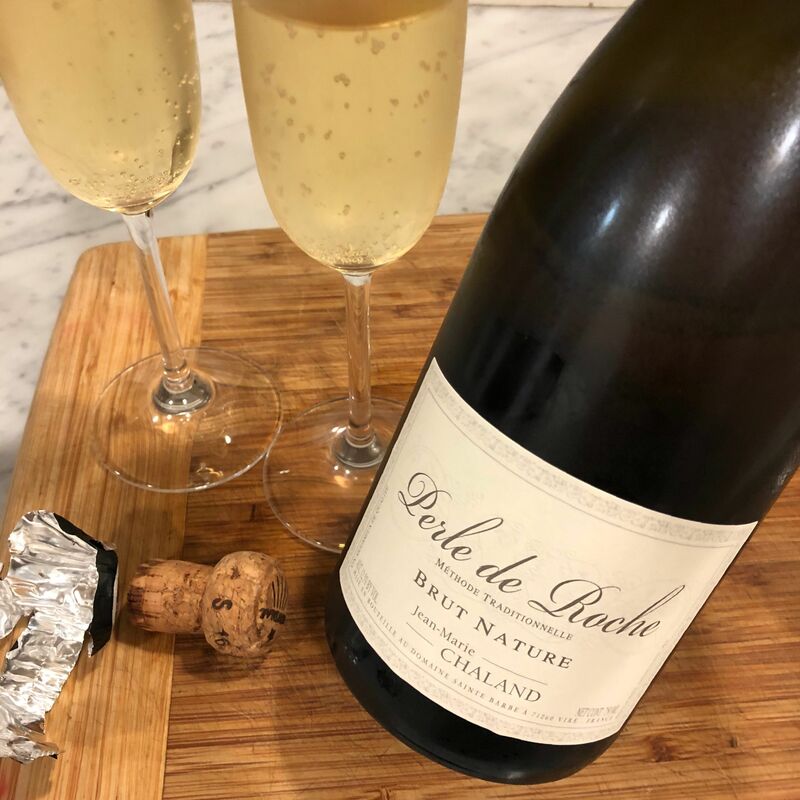 The Perle de Roche Brut Nature from Domaine Sainte Barbe is a Crémant de Bourgogne and therefore technically not a Champagne, but you’d be hard pressed to guess otherwise if given a glass to taste blind. An absolute dead ringer for authentic Champagne. And, just like it's done in Champagne, Domaine Sainte Barbe has the wine go through secondary fermentation in bottle. This is called Méthode Traditionnelle. The legendary monk, Dom Perignon, is erroneously credited for discovering this technique of making still wine into sparkling wine. The transformation of still into sparkling wine was less of a sudden discovery and more like a drawn-out process that evolved over a long time period. At any rate, Domaine Sainte Barbe’s winemaker, Jean-Marie Chaland, uses 100% Chardonnay, a blanc de blancs as it were, from the lieux-dits La Verchère, a parcel of 50 year old vines in Viré, just north of Mâcon. The Chardonnay grapes are grown on clay and limestone soils, lending a pronounced mineral quality to the wine. Jean-Marie leaves his Perle de Roche en tirage for a good long time; it sits on the lees for 30 months before disgorgement. Perle de Roche is a Brut Nature, which means it has zero dosage and less than 3 grams of sugar per litre. As a comparison, a Brut can have up to 12 grams of sugar per litre. In other words, it is a sparkling wine for Rock Heads – an affectionate term used for wine drinkers who have an affinity for mineral-driven, steely wines. At the store, we call the Perle de Roche, the Poor Man’s Les Mesnil because of that distinctive, crisp, sleek finish. Perle de Roche is not made in every vintage and production is tiny, less than 300 hundred cases produced. The bottling we have in stock is entirely from the 2014 vintage. A truly artisanal effort. And here is the real kicker - it's only $28.98 per bottle! This holiday season, I’ll be stocking up with bottles of Perle de Roche to take to parties, give out as gifts and have at the ready in case people pop by the house. The price makes it doable. It doesn’t hurt either that the package is elegant, but ultimately it is the quality in the bottle that will impress and so no one will be the wiser that I did not have to overpay for mediocre Champagne. 11 down, one to go! It’s December, and there’s no mistaking that chill in the air. The days have grown short, with the winter solstice coming up in a few weeks. We’ve already lit a few candles on the menorah, and we’ll be ready to trim the tree in time for Xmas. That makes this a super important time of year to be well stocked in the wine dept. The December Dirty Dozen has something for everyone; stop by and get your DD today! Enthusiasts of crisp, mineral-driven whites are flocking to Albariño, especially those from Spain’s Rias Baxias region. La Milla is made from biodynamic and organically farmed vines, 40-80 years old, grown on shallow sandy soil in proximity to the Atlantic Ocean. Sleek peach and apple flavors meet with a note of anisette. Keep it raw, pair with sushi or ceviche. The wine region of Rueda is located in the heart of Spain where the elevation is high and the climate continental. Rueda is the ancestral home of the Verdejo grape. Vevi’s Verdejo highlights its distinctive character, embracing vivid flavors of ripe pears. The wine sits on its lees for 4-6 months giving the wine its lush texture. Pair up with the catch of the day. Winemaker Andrew Jones claims to have stood in about every vineyard on CA’s Central Coast. This vast knowledge of the region helps him access the finest grapes. His Fiction White is a multivineyard blend of Chardonnay (80%) with Chenin Blanc and Verdelho. A combo of oak and stainless steel fermentation makes for a fleshy and lively wine. Rhône scholar, Robert Rocchi, acts as a négociant to a handful of growers in the southern Rhône, making decisions on final blends. Made from Grenache Blanc, Roussanne, Marsanne, and Clairette, it’s another great value from one of France’s value-centric regions. It shows aromas of pears and peaches and finishes soft and balanced. Happy crab season! 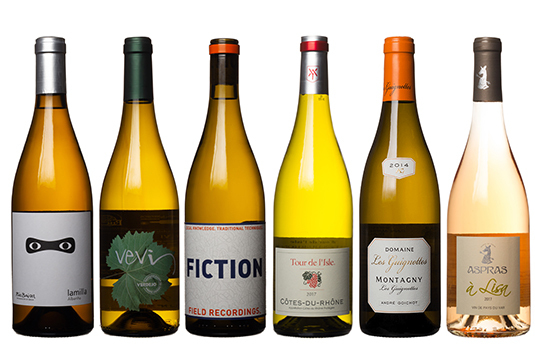 White Burgundy in the Dirty Dozen. White Burgundy which is on-sale, no less! Montagny is an appellation in the Côte Chalonnaise, which is just south of Burgundy’s vaunted Côte d’Or. Only white wines are allowed to adorn the AOC on their bottles, and the grape is Chardonnay, of course. This is an expressive, fruit driven white, pair it with scallops. It’s one thing to ask any of us which Rosé is our favorite; answering that question would be subject to the mood we’re in. Take a look at staff invoices and you’ll see that it’s this Rosé. Why not? It’s dry, crisp, and it has wonderful fruity aromas which lay in fine balance throughout the tasting experience. Pair it with a bowl of mussels and you’ll be set. CaliPaso is a small, boutique winery that is attached to a private inn. We’ve been fond of their wines for some years as they offer both quality and value. The 2016 Cabernet Sauvignon is big, bold and redolent of black plums and red currant fruit. The oak presence matches beautifully to the fruit. Impactful on the palate, serve with premium cuts of roast beast. Switching gears here with a light-bodied, soft tannin red made from Zweigelt. Zum Martin Sepp is a small restaurant and inn located in the northern outskirts of Vienna. Winemaker Michi Martin adheres to organic practices, hand picks the grapes and ferments in stainless steel. Simple and delicious, try it with lighter fare like mushroom risotto or gnocchi. Hailing from Argentina’s Gualtarry, a sub-region of Uco Valley, this is some wine. The vines are planted at the foot of the Andes at altitudes of 4600 feet! Gene is a blend of Bordeaux varietals, dominated by Malbec. Dark, crushed red cherries, forest floor and graphite flavors abound. Complex, give a decant if time permits. Grilled meats are a natural pairing. Not far from Bordeaux, you’ll find the Dordogne River Valley and Bergerac. 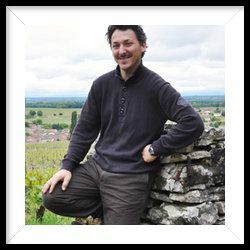 His winery may be in nearby Montravel, but Daniel Hecquet sources fruit from vineyards all around the area including Bergerac. Being so close to Bordeaux, it’s not surprising that this is made from Cab Sauvignon, Franc, and Merlot. It’s a lively number with good fruit. Burgers anyone? 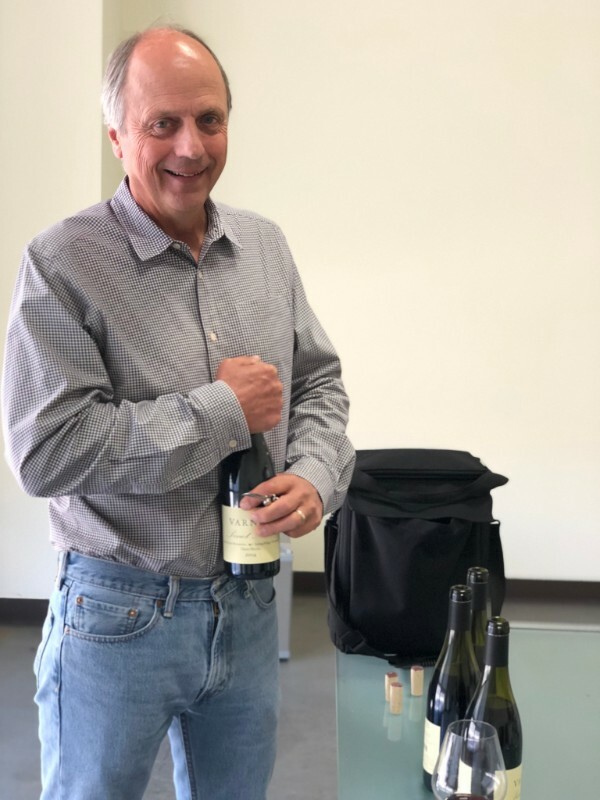 He doesn’t make it every year, but Thierry Boudinaud crafts this 100% southern Rhône Syrah when he feels he gets the proper ripeness, and names it after the Roman Governor who oversaw the building of the famous bridge, the Pont du Garde. It’s dark and savory with notes of spice, herbs, and earth. This is a great wine for a rainy night and a pot of stew. From vineyards in Bordeaux’s Entre Deux Mers region, the 2015 de Lagorce is an outstanding value! It has floral and herbal notes in the aromas, a medium body, great balance, and a touch of class one doesn’t usually find at this price point. It’s a versatile red Bordeaux, thanks to that medium body, and pairs nicely with chops, meatloaf, pizza, and pasta. Trassegum, Occitan for "Love Potion." Halloween was a hoot and so was the next day. You know what November 1st is? It's our Anniversary. This past Thursday TWH celebrated our 41st Anniversary! It's a long time to be in business and we have all of you to thank for it. As a way of saying thanks, we are currently putting the finishing touches on an Anniversary Sale to be unveiled shortly! Stay tuned. While sitting at my workstation putting the finishing touches on the November Dirty Dozen write-up, I heard Anya answer the phone. She put the party on hold, called David's attention, and told him, "Diane's on the line." It was the way she said it. Not dye-ANNE, like we say here in the states, but "dee-AHN" was how she pronounced it. I knew immediately who it was on the line. David couldn't quite make out what Anya had said over the din in the shop, but he got it eventually and picked up the line. Made me think of how cool it is to work here. Diane Puymorin has been one of our most well-respected winemakers for decades, churning out great wines vintage after vintage. It's been a long standing fact that her Les Cimels Rouge has been my go-to house red for over 10 years, and I'm not alone in my adoration of this wine. I've put many a bottle into satisfied customers' hands over this time, and I just thought it was cool that we bridge the gap between her vineyard, all the way in southern France, to you all, our customers in the good ole USA. You may have heard the story. In 1998, Diane purchased a property once known as Domaine de la Petite Cassagne and re-named it Château d'Or et de Gueules, Occitan for "Gold and Red," the colors of her family crest. My favorite facet of this story has to be the fact that some of her advisors strongly advised Diane to rip her Carignan vines out, as the variety had a reputation for over-producing, resulting in uninteresting wines. She scoffed at this advice, citing the vines' age at over 60 years at the time. She said that the complexity derived from such a gift in the vineyard would enable her to make great wine. I'm a big fan of pragmatism in the face of peer pressure. I am also grateful, because a tiny bit of that Carignan makes its way into that Les Cimels Rouge, and that is perhaps the reason I love it so much. Diane uses the fruit from her Carignan vines, now over 80 years old, in another blend known as Trassegum, Occitan for "Love Potion." You may remember Trassegum from the past, but probably not from any recent vintages. That's because a local French restaurant had pretty much swept up the past 3 vintages for their by the glass program. But just like a good comfortable sweatshirt, things have to be changed out every now and then. So when the 2015 Trassegum arrived, we were delighted to know that it's back on our shelves, and that we, the staff are able to purchase the wine for our own enjoyment. Currently in stock is the 2015 vintage of Trassegum. The blend is 50% Syrah, 25% old vine Mourvèdre (80+ years old), and 25% old vine Carignan. Production is a stingy 25 hl/ha. The wine is full-bodied, focused, and concentrated. The fruit is savory in character, more in the way of black olives than plummy fruit and/or berry notes. It's the perfect red for the season and a great wine to pair with the hearty fare we tend to enjoy once the nights grow long and a chill hits the air. It has a distinct forest floor aromatic, which is a byproduct of the old vine Carignan, and a hint of black tea-like tannin on the finish, two particular components I enjoy in red wines. It's not exactly priced at the Tuesday night, happy-go-lucky level, but for the quality one finds in bottle of Trassegum, this is a great value! Twin brothers, Jim and Bob Varner are responsible for planting, growing and making some of California's most compelling Pinot Noir. They had been growing Chardonnay on Spring Ridge Vineyard since the 80's, but in 1995 they embarked on planting Pinot Noir. Their approach was similar to planting Pinot Noir as it was to Chardonnay, in small block parcels. The Spring Ridge Vineyard is a unique site. It is situated next to an open space preserve and sits on a property that spans elevations from 500 ft to 1800 ft. in the Santa Cruz Mountains. One ridge away from the Pacific Ocean only 10 miles away as the crow flies. 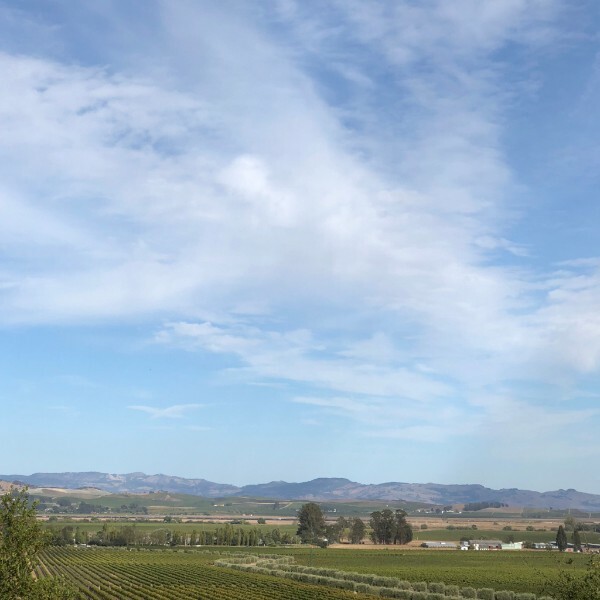 This protected area experiences typical Bay Area maritime weather but at the altitude which the vineyard sits, the nights are even cooler and daytime highs are less sizzling, making it ideal for grape growing. The Varners make three single-block Pinot Noirs: Picnic, Hidden, and Upper Picnic. The blocks are small; combined, they total 6.5 acres. Earlier in the month, not long after ten o'clock when we unlock our front door and begin the business day, in walked a man who apologetically asked if we were open. If I am sitting at my work station and look towards the door, people entering the store are back lit, so recognizing someone can be a challenge at first glance. I stood up and quickly knew who it was. Bob Varner. Well, that's not entirely true. Bob and his twin brother, Jim, look awfully alike, so it was considerate of him to stretch out his hand and greet us with "Bob Varner". At TWH, we've been lucky to have these unexpected visits from the Varner brothers. Sometimes it is Jim and sometimes it is Bob. Their visits are always a highlight to working here, but this last visit was particularly meaningful and memorable. 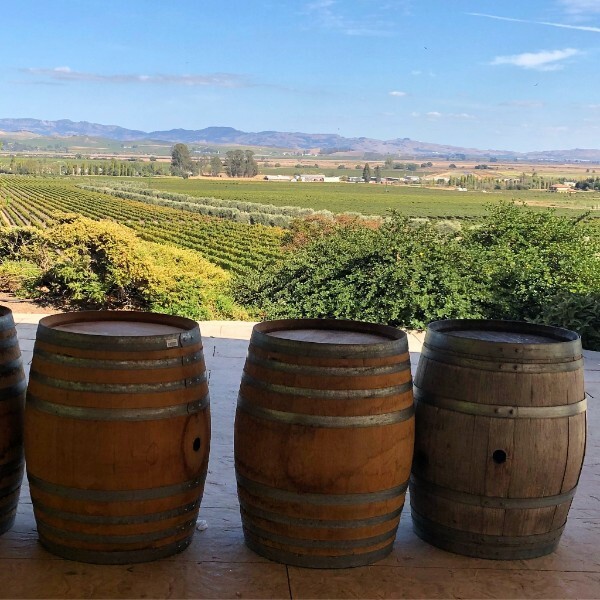 The last couple years have found the Varners facing many challenges, not the least of which, they will no longer be making wine from Spring Ridge Vineyard. The 2014 vintage is their last. Bob lead me through the newly released 2014 Pinot Noirs. He started with a refresher course about the site, how the sedimentary rock is a combination of clay and loam and is almost sponge-like, explaining that when it rains, the water drains away in minutes. He went on to tell me that they dry farm, use no fertilizers and grow natural cover crops. The first wine we tasted was the 2014 Hidden Block. It was very open-armed and generous right out of the bottle. Hidden Block is planted to a clone of Pinot Noir called Dijon 115 and is north-facing. Bright, red cherry fruit rushes out of glass and lingers on the palate. Aged in French barrel, about 20-30% new (as do the other blocks), it is remarkable how well integrated the wood is with the fruit. A seamless structure. Next came the 2014 Picnic Block. It is the lowest vineyard, sitting at 600 feet and has the shallowest soil. A darker fruit profile than the Hidden Block, the acid perception is also more intense. The wine has real energy. They chose to go with an "elegant" barrel, one that has no heavy char. Next up was the 2014 Upper Picnic. Here, the Pinot Noir was grafted on to Gewurztraminer that was originally planted in 1981. Bob described the energy of the plants as old-vine. Upper Picnic is separated by only ten feet from the Picnic Block, but it has a bit more soil. It is always the last block to be harvested. The flavors are denser with red cherries galore, but the wine remains elegant throughout. One vineyard, three blocks of Pinot Noir: all three subtly different, but all three amazing. 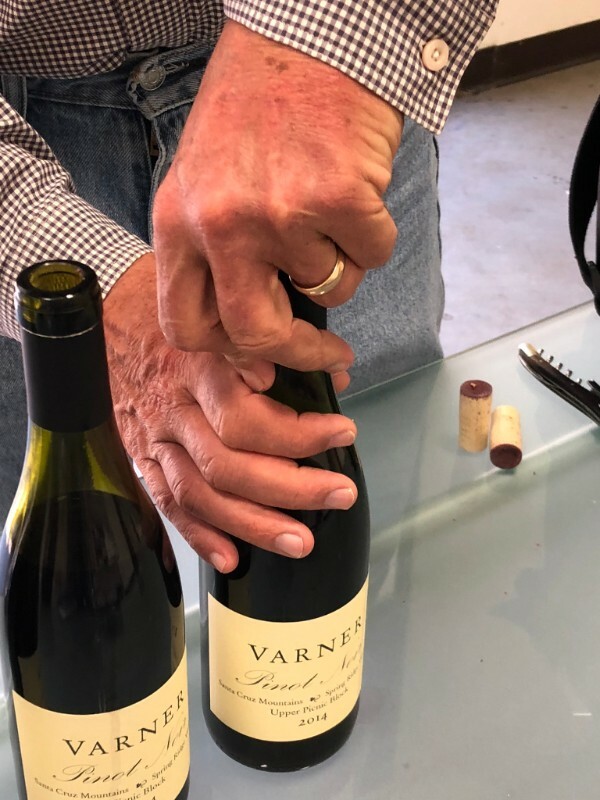 Varner wines are the result of thirty-five years of hard work. Self-financed, they sold grapes long before making it commercially. They took on a long cycle of planting, as they didn't want to make any mistakes. Bob explained to me that "over time, site will dominate". All their decisions, all their attention to detail in the winery (i.e. they designed their own tanks) was an effort to take all that they learned along the way to carefully choreograph the outcome. 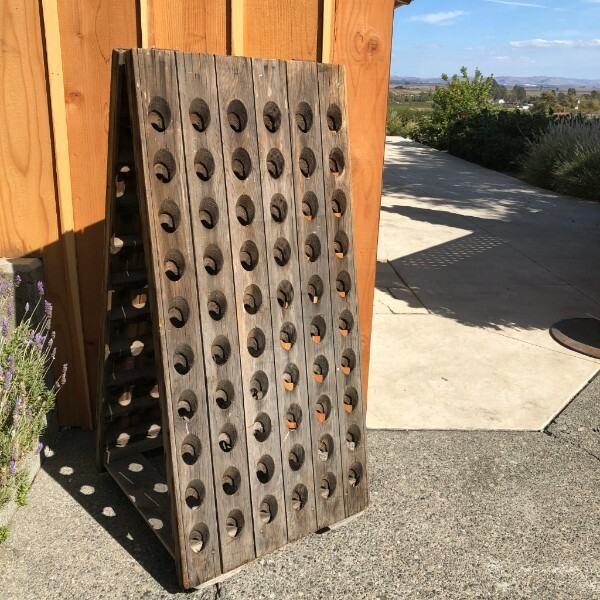 Bob told me that his passion for making wine rests in the interplay of Science and Art. After Bob left the store, I was overwhelmed by emotion. I was thankful for this industry that gives me an opportunity to meet people like Bob (and his brother). Making wine is not a vanity project but a way of life for the Varners. Great people, great wine. 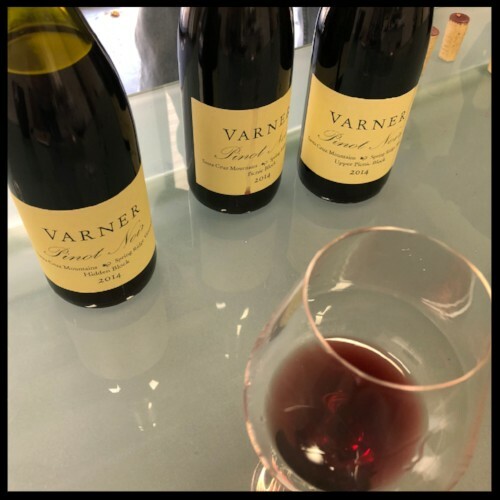 Do not miss out on the 2014 Pinot Noirs from Varner. Just don't. "The 2014 Pinot Noir Hidden Block is the most immediate and dense of the four Pinots in the Varner range. A core of sweet red cherry and plum fruit fills out the wine's mid-weight frame effortlessly. Round, pliant and totally seductive, the 2014 has a lot to offer, including tons of near and medium-term appeal." 93 points from Galloni for Vinous. "The 2014 Pinot Noir Picnic Block is bold, powerful and beautifully resonant on the palate. Succulent red cherry and plum fruit is nicely pushed forward, with pretty floral and savory notes that add striking aromatic complexity. There is lovely depth and texture to this pungent, racy Pinot Noir from Bob and Jim Varner. Beams of tannin underpin the subtle yet persistent, structured finish." "The 2014 Pinot Noir Upper Picnic is all class. Silky tannins and expressive, perfumed aromatics give the wine unreal finesse. Just as compelling on the palate, the 2014 is absolutely exquisite in its understated, nuanced expression of the Santa Cruz Mountains. What a gorgeous wine it is. 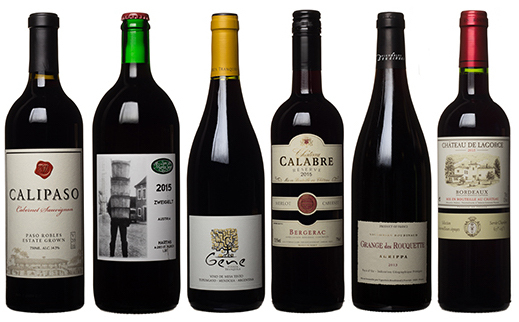 The Upper Picnic is the most elegant of these four Pinots." 95 points from Galloni for Vinous. While walking the streets of our neighborhood this afternoon, I couldn't help noticing the general good vibe of throngs of folks out enjoying the warm weather, sitting in parklets and outdoor tables, sharing the weekend with those of us who work and live here. We had more than a couple of first timers poke their heads in our shop today, asking what we're all about. As many of you know, we are always happy to share our stories, answer questions, and put quality juice in your hands. Now that we're moving deeper into autumn, days like today will be fewer, but the vibe this afternoon has me longing for something chilled and delicious. What's this week's Saturday night wine and how did it come to us? 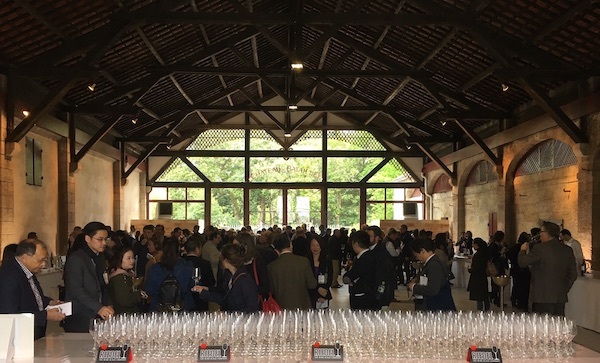 It's the 2017 Torre Zambra Colle Maggio Pecorino and to answer the second part, good connections. 41 years is a long time to be in business, and we will turn 41 in less than two weeks! (Pssst - Yes, there will be an Anniversary Sale - stay tuned!) And when you're in business that long, you're bound to make connections. 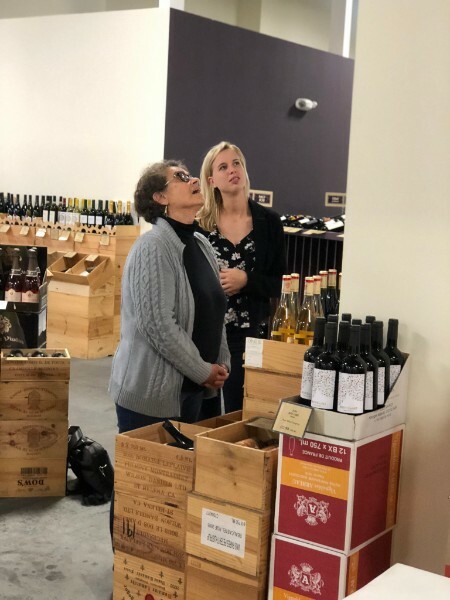 It hadn't been that long after we signed up Tiziana Settimo and her line of wines from Aurelio Settimo: Dolcetto, Langhe Nebbiolo, and those amazing Baroli, that a package arrived with a range of samples from a producer in d'Abruzzo. Tiziana highly recommended that we try them and let her know what we thought. Shortly thereafter, we found ourselves in the tasting room with the samples. There were the usual suspects one finds in d'Abruzzo, Trebbiano and Montepulciano, but there were a couple of other wines including a Pecorino. Pecorino was not named from the sheep's cheese, its name actually was derived from sheepherders who ate these grapes while tending to their flocks in search of food. Italian wine grape maven, Ian d'Agata wrote in his tome Native Wine Grapes of Italy, "Pecorino is not just a grape variety; it is also one of Italy's biggest wine success stories of the twenty-first century." I have been on a Pecorino kick ever since Anya brought one in for The Dirty Dozen back in 2010. It's gotten to a point where I just have to have it when I see it on a wine list in a restaurant. So when we were tasting the Torre Zambra wines, my inner wine enthusiast was giddy for a taste of the Pecorino. It did not disappoint. That's an understatement. It was remarkably delicious! The aromas are of stone fruit, orchard fruit, and citrus blossoms. Its aromas alone are captivating. On the palate, it has a medium body and bright acidity which sweeps the aromatic complexity into harmony. I still can't get enough of this wine. Another reason I can't lay off in a restaurant, is its ability to pair with food. Often times, when one chooses the wine before the food, your dining options diminish if looking to dial in a perfect pairing. Not so much with Pecorino. This wine works with most seafood entrees and appetizers, and lighter land meats such as porchetta or turkey breast. I was over the moon for the Colle Maggio Pecorino! Heck, I didn't even have to taste any of the other wines to know we would be bringing them in, but for the record, all of the wines were outstanding, and they all represented excellent value at their respective price points. David and our staff were all in agreement. Any guesses who now imports Torre Zambra into California? TWH, of course. 20 years of marriage! Where did the time go, my love? My husband and I enjoy sparkling Rosé, especially from Champagne. In the early days of our courtship, my husband wooed me with it. That was the right strategy to take with me as I not only loved the stuff, but also appreciated a man who was sure of his own tastes. So when the day came that marked our nuptials, there was no question that we'd be drinking Champagne Rosé. We drank the 2012 Labruyère Anthologie Brut Rosé, a blend of 70% Pinot Noir and 30% Chardonnay, all Grand Cru fruit. I was inspired to try it because a customer of ours, whose palate I respect, recently went ga-ga over the Anthologie, describing it as being "unlike anything else I've tasted". I wanted a unique experience, and I got one. The Anthologie spends an extended time on the lees which creates depth and a rich, vinous structure. It is loaded with cherry fruit; so well-suited for main dishes, not just a ceremonial toast. Because our Anniversary fell mid-week and work/school schedules don't change just because you've shared a life over the past twenty years with the same person, we did not go out to a restaurant nor did we had time to prepare a fancy meal. Instead dinner was generously provided by my in-laws who made eggplant Parmesan using eggplant from my garden. The pairing worked beautifully. Needless to say, one glass quickly turned into two. We drained the bottle. 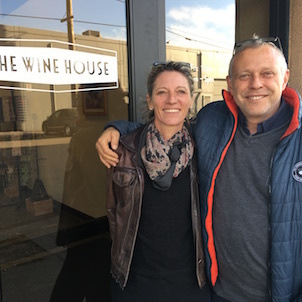 Our Anniversary weekend, as it were, coincided with a visit from Alexandra Lièbart of Champagne Liébart-Régnier (she and my daughter share the same name!). It was a delight to meet her and taste through the wines her family makes from their 10 hectares of vineyard. Alexandra, now finished with her studies, is taking on a more prominent role at the winery. 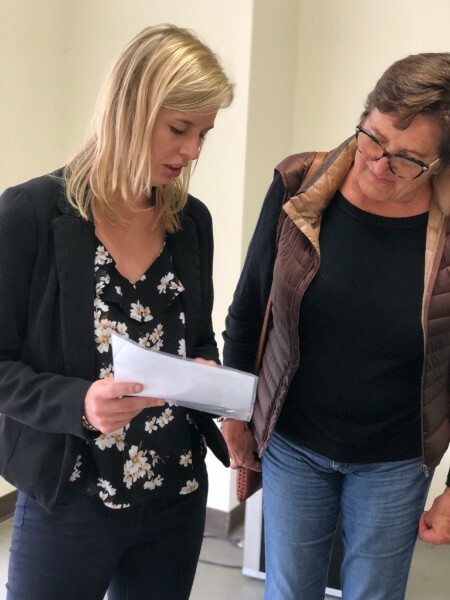 Some of our customers got the chance to meet her and learn more about this small, grower-producer Champagne house. After an impromtu tasting, the remaining bottles were divvied up between TWH staff. I didn't hesitate to ask for the Brut Rosé. Made from a blend of Pinot Meunier (50%), Pinot Noir (35%) and Chardonnay (15%), it has delicious aromas of Sterling roses and flavor notes of blood orange and raspberries. It has formidable fruit impact yet remains elegant on the palate. That evening saw another end to a busy day, so I stopped at our favorite local taqueria on the way home for carnitas tacos. And now a new tradition has been born! Liébart-Régnier Brut Rosé and carnitas tacos (move over fried chicken!). What a super match-up. The fat, acid and salt quotient hit on all cylinders, thereby making the pleasure points in my brain explode. Just yum. Our Anniversary weekend concluded with a quick overnight trip to Sonoma. It is rare that I head that way, but I never miss an opportunity to stop by at Gloria Ferrer Winery. I made arrangements in advance for a visit and was well taken care of thanks to someone who will remain nameless (but you know who you are!). The view is unparalleled, the hospitality is top-notch, and the wines are absolutely terrific. I have been a fan of Gloria Ferrer's bubbles for decades, really. We tasted through a flight with nibbles and for once, in a very long time, I felt relaxed and far away from it all. At the winery I tasted their vintage Brut Rosé, but here at The Wine House we carry their non-vintage Brut Rosé. It is made up of hand-harvested, estate grown, Carneros fruit. A blend of Pinot Noir (60%) and Chardonnay (40%) it remains on the lees for at least 2 years before bottling. It is a real stand-out for California sparkling wine. All in all, my 20th Anniversary celebration was as joyous and full of surprises and warm moments as the last twenty years have been with my husband (love you, Koshka). This and plenty of Brut Rosé. Domaine Fondrèche and TWH, 25 years in business together! But, believe it or not, that's how long we've been selling the wines made by Domaine Fondrèche. Nanou Barthélemy bought the domaine in 1991, and asked her young son, Sébastien Vincenti to help her out, and by 1993, Sébastien was a winemaker. 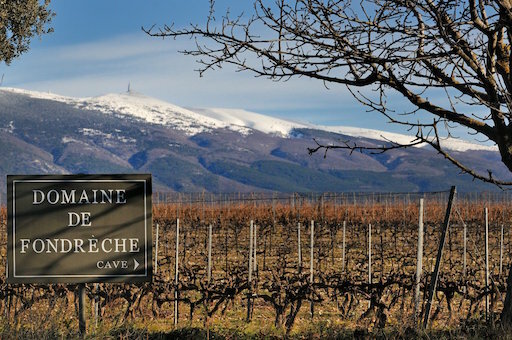 With just vineyard land, Barthélemy and her son had no winery in which to make any wine in those early days, but family friend André Brunel (some of you may have tasted this Rhône giant's wines) rented out part of his cellar for the budding winemaker. Though he later graduated from oenology school, Vincenti still claims Brunel essentially taught him everything he knows about making wine. As longtime agent for importer Robert Kacher Selections, TWH was already stocking Brunel's wines, and my, they were delicious and popular! André must have convinced Kacher to take a shot at representing Fondrèche in the states, and Bobby recommended we get on board as well. 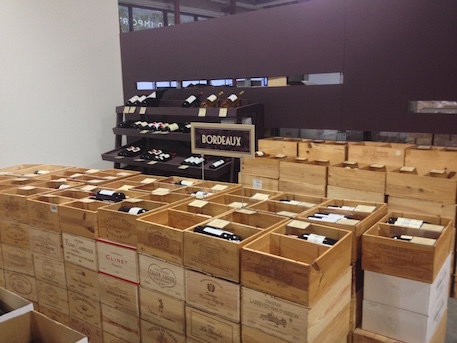 The rest, as they say, is history; only that RKS was later sold, and we are now Sébastien's importer. One has to be impressed by the evolution of this relatively young man. Beginning at 21, he wowed critics early with his expressive, pure fruit-focused wines. He continued learning and evolving, tinkering in the vineyard, and began to experiment with organic and biodynamic practices. By 2009, Fondrèche was certified organic by French body Ecocert. As Robert Parker was nearing retirement, the market was changing. Wine drinkers were seeking out elegance and freshness over heft and power. Sébastien was ahead of the curve, as he himself preferred wines that were in this style. Constantly evolving, Vincenti changed some labels, began using different vineyards for different bottlings, and eased up on the extraction with some of his wines. After organic certification, Sébastien seemed to be headed down the natural path of experimenting with biodynamic techniques. We noticed the uptick in quality vintage after vintage, and were proud to represent such a rising star! Then Vincenti made a surprise announcement. In early 2016, he withdrew his wine from organic certification over concerns about the long term vineyard sustainability of organic farming, namely the build up of copper in the vineyard. He believes certain synthesized products may offer better environmental protectionthan some organic alternatives, but they're not recognized by the governing body. We're excited to continue representing this visionary who is not afraid to stand up for what he believes in. 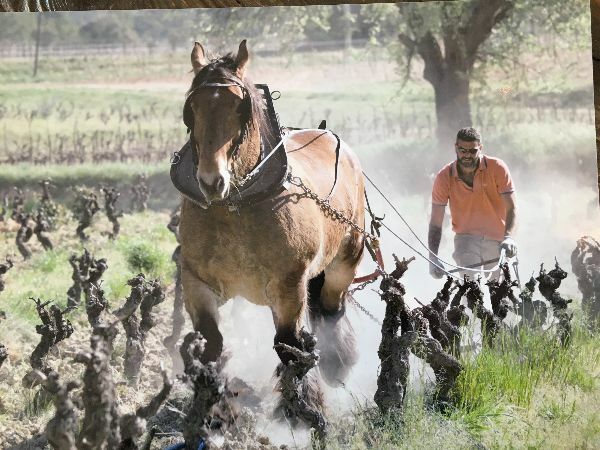 That's why we were so happy to see a link on Twitter earlier this week to a blog post from Wine Spectator featuring Sébastien, and recounting his story. Brand new, from our latest container are Sébastien's 2016 Ventoux Rouge and 2017 Ventoux Blanc. If you haven't had any of his wines lately, these two gems are proof that someday, when talking about an up and coming winemaker, we're likely to say, "They learned from Vincenti!!"